If you are looking for a fun activity for your hen party, birthday celebration or just a good old night out in North Yorkshire then Harrogate is the place to be. Book a cocktail making class in Harrogate and you will have the time of your life. 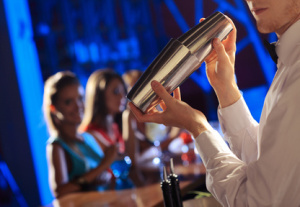 When you get behind the bar with your expert bartender you will learn some great tips so you can confidently serve cocktails at your next house party. The cocktail classes in Harrogate vary but usually include a welcome drink to start your class off. Each member of your group will then get behind the bar to make, shake and mix their favourite cocktail while you play fun cocktail making games. You will of course get to drink the cocktails you make. But that is not all. You will have food and another drink at the end of the cocktail lesson in Harrogate. All this at a great price of £25 per person. Enquire about your cocktail masterclass through us and we will give you a choice of venues and packages. You can then choose the best one to suit your needs. The packages all vary but we will offer you a choice so that you pick the cocktail making class that is best for your group. Harrogate is a fun town and ideal for hen parties and birthdays. If you are looking for a corporate team building event to bond your work mates then learning to make cocktails is a fantastic idea too. But remember, you will need to come prepared …. prepared to have a lot of fun. Before the cocktail class you can explore Harrogate and all that is has to offer. North Yorkshire is proud of this spa town and so it should be. From shopping to historical landmarks, Harrogate has it all. After your class you can party the night away in the lively bars in the town centre and have a fantastic end to the night in one of the many trendy nightclubs. The games were really fun and got everyone involved. The amount of cocktails we were able to make meant it was good value for money. Our bartender was great and helped in making the experience so enjoyable. Excellent value for money, brilliant customer service. Would (and already have) recommend it to others.